Yeah, I’m there… I’m just good at reading and not owning lol. Kaloka! I saw this Hermes Birkin bag while net shopping, wow! As if I had lottsa moolah! 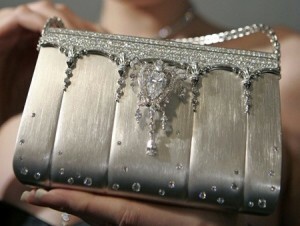 But nothing compares to the lavishness of this Birkin designed by Japanese designer Ginza Tanaka. …. Double wow! It was said that this bag was sold at a staggering $1.9 million … sisiw! Making this bag the most expensive in the world. In the Philippines, there are already many sightings of Birkin bags, Mayaman na ang Pinas, Sharon Cuneta, the famous Birkins in line of Jinkee Pacquiao, Greta, and many more...... and the next in line.. that would be me … in my dreams…. Hi, jen.. korek ka diyan... heheh.. wala lang inmy dreams lang,lol. Hahahaha, bonggacious na life ni jinky pacquaio heheheh... Yaa mo ate pag nanalo ako sa lotto, I'll remember this one for ya lol, isa pang nangangarap lol..